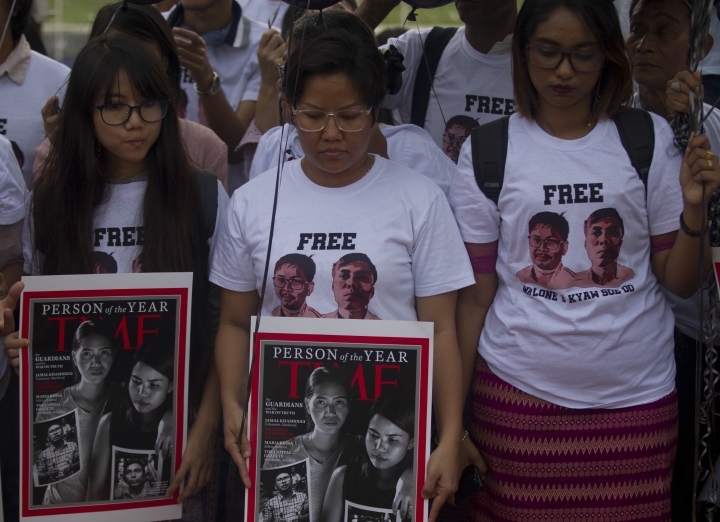 YANGON, Myanmar — Several dozen journalists and activists held a rally Wednesday in Myanmar's biggest city to mark the anniversary of the arrest of two reporters for the Reuters news agency who are among a group of journalists being honored by Time magazine as its "Person of the Year." 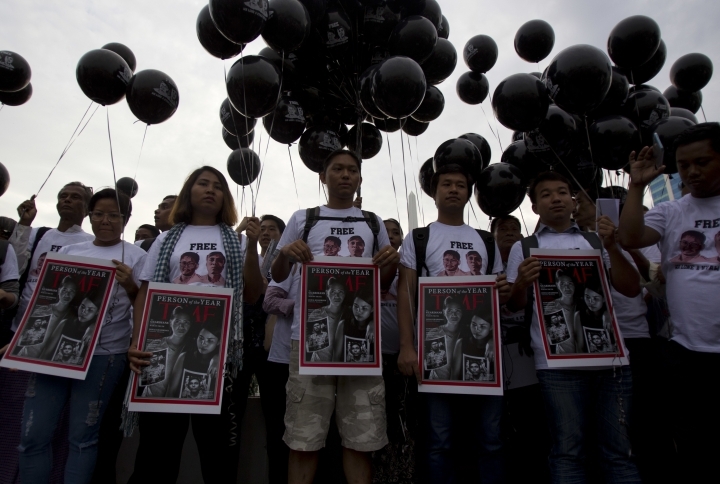 The protesters wore T-shirts calling for the release of Wa Lone and Kyaw Soe Oo, who had reported on a brutal military-led crackdown on the Muslim Rohingya minority. They were arrested a year ago and charged with illegal possession of official documents. The two, who were sentenced in September to seven years' imprisonment, denied the charge and said they were framed by police. Their appeal is expected to be heard later this month. The protesters near Myanmar's High Court carried placards with the cover of some editions of Time's next issue that show a picture of the men's wives holding photos of their husbands. They also released black balloons into the sky and lit candles. Paling Soe Oo, one of the journalists who joined the rally, said the magazine's focus on the jailed journalists was an honor for Myanmar and its journalism community. "But I don't think the government feels shame for its part, and isn't considering releasing them, not even a little," he said. The reporting by the two men about the military campaign that drove 700,000 Rohingya to flee to Bangladesh is believed to have drawn the government's wrath because of worldwide condemnation of military abuses, which it denies. 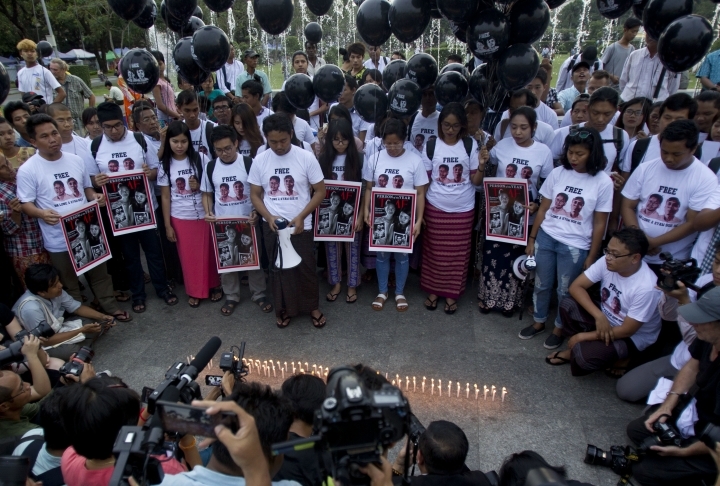 "A year ago, Reuters reporters Wa Lone and Kyaw Soe Oo were arrested in a setup by police, intended to interfere with their reporting on a massacre in Myanmar," Reuters editor-in-chief Stephen J. Adler said in a statement prepared for the anniversary of their arrests. 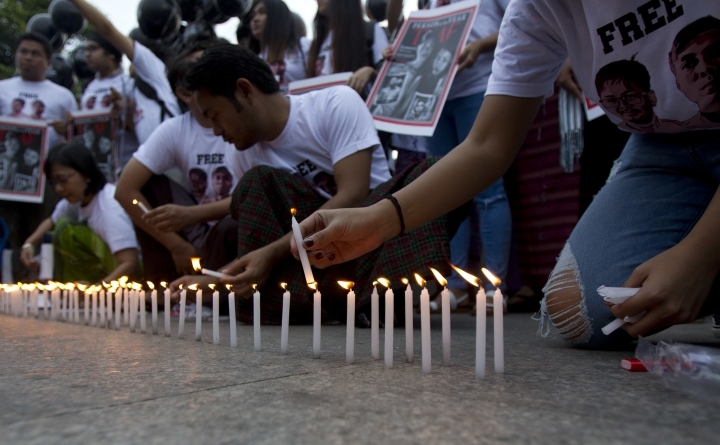 "The fact that they remain in prison for a crime they did not commit calls into question Myanmar's commitment to democracy, freedom of expression and rule of law. Every day they continue to be behind bars is a missed opportunity for Myanmar to stand up for justice. 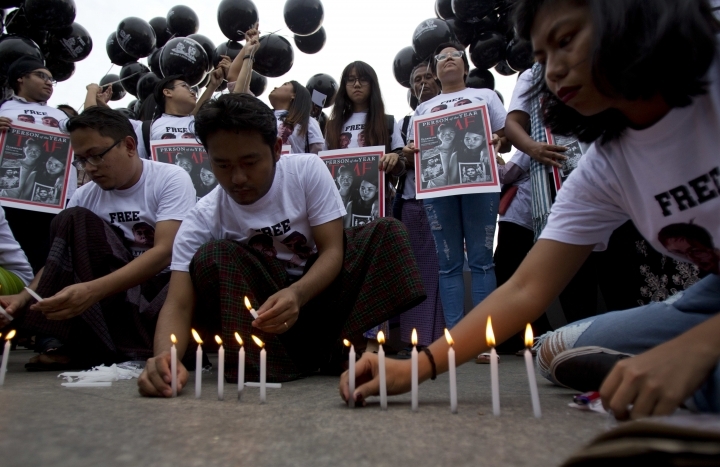 The people of Myanmar deserve the freedoms and democracy they have long been promised, and Wa Lone and Kyaw Soe Oo deserve to be returned to their families and colleagues immediately," he said. Prosecution testimony at the men's trial was weak and inconsistent, and a police officer gave testimony confirming defense allegations of a setup. After testifying, the officer was dismissed from his job and sent to prison for violating police regulations. 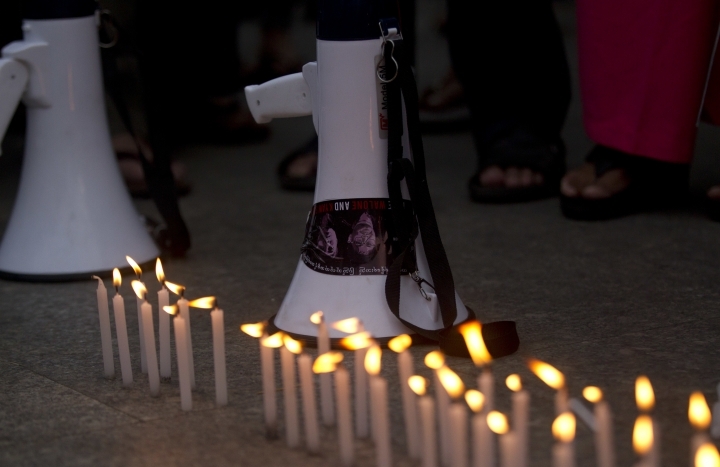 The case is widely seen as an example of how democratic reforms in long-isolated Myanmar have stalled under the civilian government of Nobel Peace Prize laureate Aung San Suu Kyi, which took power in 2016. Although the military, which ruled the country for a half century, maintains control of several key ministries, Suu Kyi's rise had raised hopes for an accelerated transition to full democracy, and her stance on the Rohingya crisis and press freedom has disappointed many former admirers.